Pedestrians Among the Not-So-Pedestrian « Midlife Crisis Crossover! It’s weird how residents of cities with colossal attractions develop an immunity to the awe-inspiring sights they walk past every day. I suppose it’s a necessary defense to function in their otherwise normal lives. Each time we’ve visited Manhattan, the only pedestrians gawking at all the skyscrapers and at the neon overdose of Times Square were out-of-towners like us, even though we have skyscrapers back home. New Yorkers might raise an eyebrow at Broadway “coming soon” signs depending on the cast and on what famous movie or cartoon they’re adapting this week, but they keep it too subtle for the casual passerby to catch. Meanwhile in Colorado, workaday professionals don’t stroll the streets of Colorado Springs yelling at each other, “OH, WOW, LOOK AT THOSE ROCKY MOUNTAINS!” Sixteen hours of wonderment per day might be too much for anyone except residents of the most blissful utopias, assuming decades of proper conditioning. Every so often we’ll meet other Christians who speak to the breathtaking majesty of God’s Creation and share how they try not to take such things for granted every day, noting it with some combination of admiration and gratitude. Too often they’re outnumbered by other citizens who look up for a second, confirm to you that, “Yep, that sure is Niagara Falls over there,” and walk past you disaffected. This weekend Anne and I drove down to Knoxville, Tennessee, for an event and some light sightseeing. 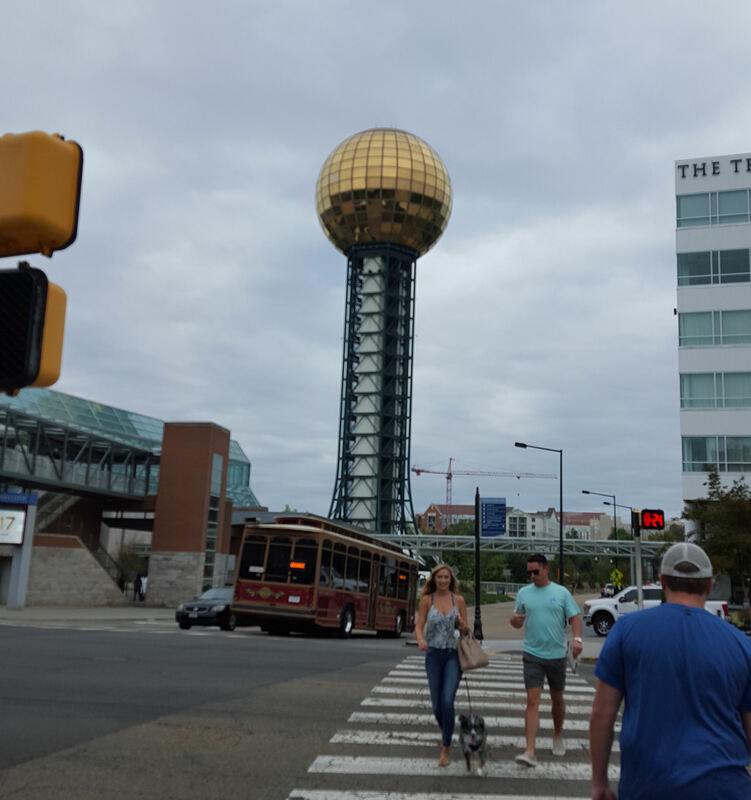 Miles from town we could already spot its most prominent structure — the Sunsphere, one of two surviving major remnants from the 1982 World’s Fair. Our generation knows it best from its appearance on The Simpsons. Much of the surrounding area has changed since that episode aired in 1996. Current tenants inside the globe include an Italian restaurant and an event coordinating company. I saw no wig stores anywhere nearby. The Sunsphere remains the same on the outside. A few of us tourists approached and marveled at its unique architecture, at its unnatural gleaming, and at its remarkable history as a 35-year-old landmark holding a small but solid spot in the American pop culture consciousness. To the locals? Yep, that sure is an office building over there. It first occurred to me as I walked the streets of Colorado Springs a while back. Everywhere you turn, the Rockies are right there looming in the background. Maybe it’s more noticeable to me because we have exactly zero mountains here in Indiana, but I couldn’t stop gawking at them every five minutes. I don’t know how people take entire mountain ranges for granted!